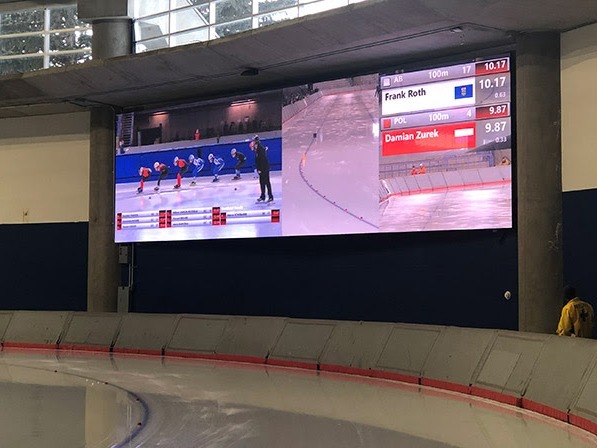 Daktronics has partnered with the Olympic Oval in Alberta, Canada, to deliver two new LED video boards and control equipment. Everything for the project was manufactured and installed in 2018 to be fully operational at the start of the 2019 calendar year. A new main video display was installed at one end of the venue featuring 650 square feet of video display space. It employs 6-millimeter line spacing and measures 12.5 feet high by 52 feet wide. Additionally, a portable display featuring the same 6-millimeter line spacing and measuring 12.5 feet high by 25 feet wide was provided to the Olympic Oval. This display can be moved to different locations throughout the venue to maximize viewing during any event. Both displays are capable of variable content zoning allowing each to show one large image or multiple zones to show any combination of content. Live video, instant replays, statistics and event information, graphics and animations, sponsorship messages and more can be shown to inform and engage audiences. Custom Daktronics control components were delivered and integrated with the installation including front end video equipment. This equipment helps connect the new displays with an existing Daktronics LED display for a cohesive visual experience for all audiences and events within the venue.